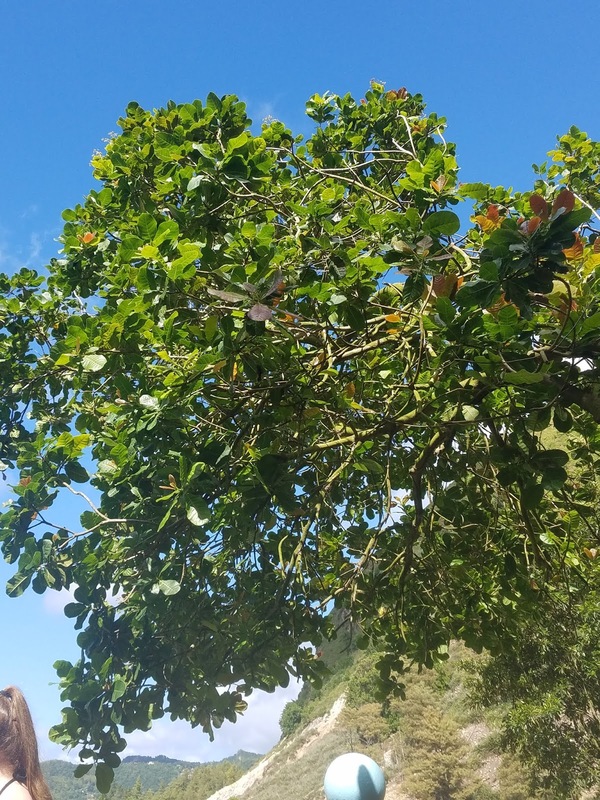 The Cashew Tree Anacardium occidentale is a tropical evergreen that produces the Cashew seed and Cashew Apple. Reaching heights of around 45 feet it is not a large tree by any means. The trunk is generally short and irregular in form. The dwarf variety is considered to be more profitable having earlier production maturity and higher yields at around 20 ft tall. Native to Brazil, Portuguese colonist were recorded to export the tree and nuts as early as 1550. Currently there is major Cashew production occurring in Vietnam, India, Nigeria and The Ivory Coast. 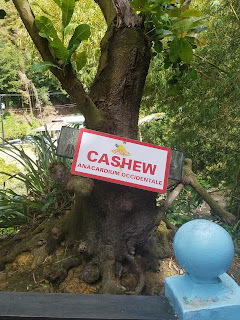 During the 21st century Cashew cultivation has significantly increased to meet new demands for manufacturing of Cashew Milk a plant based alternative to Dairy Milk. In 2017, globally the production of Cashews was measured in tonnes at 3,971,046 with the leading producer being Vietnam 22%, India 19% and the Ivory Coast 18%. Benin, Brazil, Guinea-Bissau, Indonesia, Mozambique and Tanzania are all notable producers. The leaves of the Cashew Tree are spirally arranged, elliptic to obvate in shape and leathery in texture. The flowers are produced in panicle or corymb up to 10 inches in length. Flowers begin as small and pale green in color, becoming red and slender with maturity. The Cashew Nut, simply called Cashew is widely consumed throughout the world. It can be eaten alone, used in baking, as a salad topping or processed into Cashew Cheese or Cashew butter. The Cashew Apple is a light red to yellow fruit similar to a gourd in appearance, it is an accessory or false fruit. The pulp of this false fruit can be processed and made into a astringent but sweet drink or distilled into liquor. The actual fruit of the tree is the kidney shaped drupe that occurs at the base of each Cashew Apple. Within each true fruit is a single seed (or nut), this seed is surrounded by a double shell that contains a resin that is an allergenic phenolic, called anacardic acid. Anacardic acid is chemically related to Urushiol which is the toxin found in Poison Ivy. For this reason Cashews are not readily available or sold in shell direct to consumers. 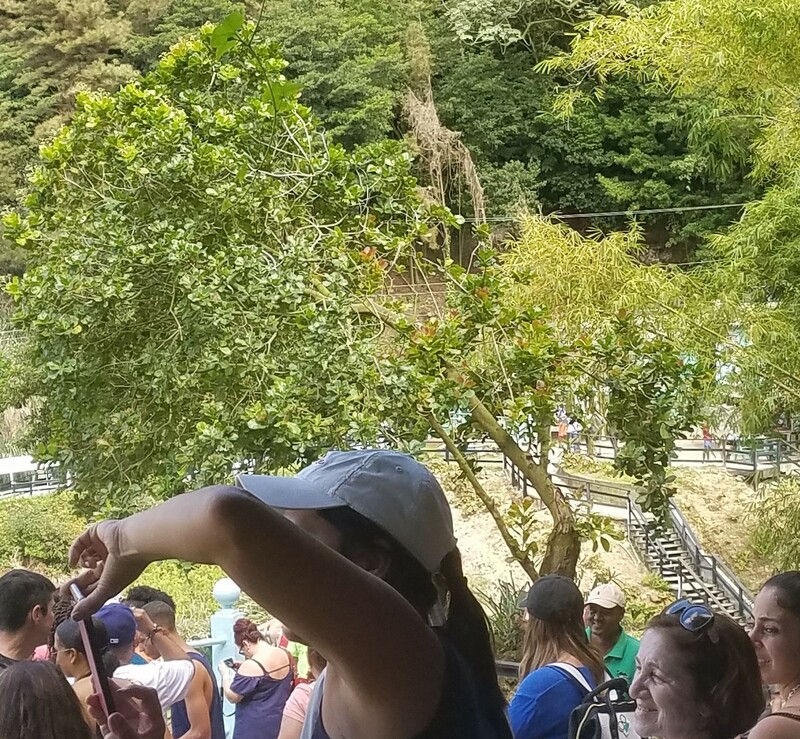 We recently visited Saint Lucia (one stop on a cruise) and while there we toured the Drive In Volcano / Geothermal Area near Soufrière. 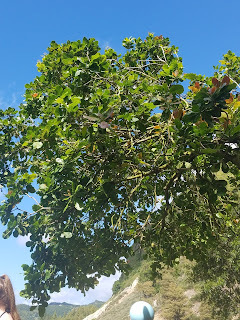 There at the site just on the edge of the overlook was a lone Cashew tree, the first I have ever seen in person (and not in a book) so I was quite intrigued. The tour guide explained how the Cashew was not native to the island, but was introduced over 100 years ago and is now found throughout the island. She also explained in depth about the risks of eating or handling an "unprocessed" Cashew because of what she called the "poisonous shell". The tree itself appeared to be mature between 35-40 ft tall and has had obvious damage from what I assume to be weather combined with tourist over the years. Perched at the edge of the overlook it is only protected by a small rail system but otherwise is right in the flow of foot traffic. It's trunk is irregular and gnarly in appearance and part of the canopy appears to have broken out well before our visit, though it still hangs on directly above the (Smelly) Sulphur Springs bubbling below. Another testament to the strength and determination we so often see in nature. Location - Sulphur Springs (geothermal area) Soufrière, Saint Lucia.